Small business is the incubator of employment. 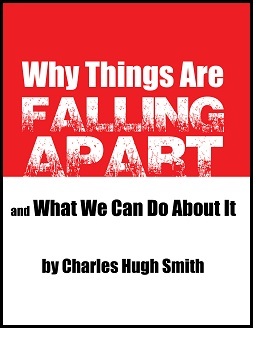 As it declines, so too do opportunities for first jobs, second chances and economic independence. Self-employment and small business are two sides of a single economic coin: financial independence. The Bureau of Labor Statistics (BLS) counts two types of self-employed, the unincorporated and the incorporated. The unincorporated may have employees, but typically do not, i.e. they are sole proprietors. The incorporated have employees, starting with the owner, as the BLS counts the incorporated self-employed as employees of their own corporation. I know that's confusing, but it's important to separate the sole proprietors from those "self-employed" incorporated businesses that have employees: law firms, doctors' offices, accountants, etc. When we speak of "small business," we're referring in large part to the incorporated self-employed: people who establish corporations as the legal structure for their enterprise. Nothing is simple when it comes to parsing all the data, of course, but the BLS has a paper that explains the basic categories: Self-employment in the United States (Bureau of Labor Statistics). 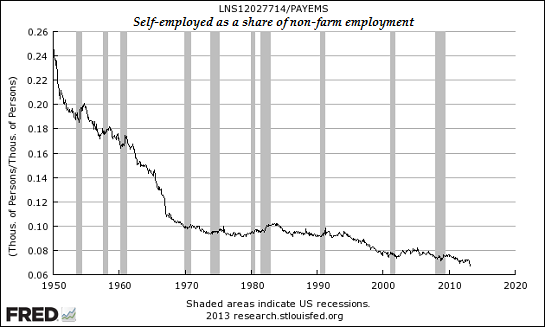 The BLS attributes the decline in unincorporated self-employment from 1950 to 1970 to the consolidation of agriculture. As agriculture became more mechanized, small farms were no longer viable and farming required less labor. As a result, many self-employed farmers and laborers became employees or moved to other sectors. We can attribute this trend to the rise of global Corporate America and government employment. The workforce expanded, and relatively more people became employees of corporations or the government than became self-employed. It's important to note here that the BLS does not break down the income of unincorporated self-employed: if millions of self-employed saw their net incomes slashed in the recession, the BLS still counts them as self-employed. So a consultant who earned $100,000 prior to the recession and now scrambles to net $10,000 is still self-employed. This is the statistical equivalent of 6 million people losing full-time jobs and then 4 million of those people getting part-time jobs. Did employment truly recover most of the losses? 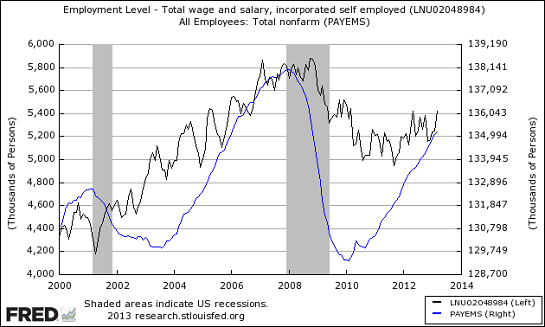 This chart displays total non-farm employment (blue) and the incorporated self-employed. 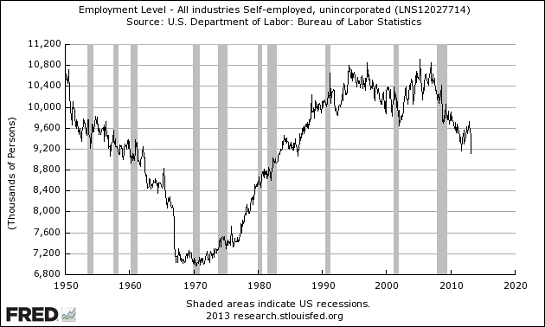 Unsurprisingly, the rise and decline of the incorporated self-employed tracks the general economy and total employment. Historically, in order for incorporated self-employment to grow, it requires an increasing share of the population that is inclined to, or capable of, first becoming unincorporated self-employed. 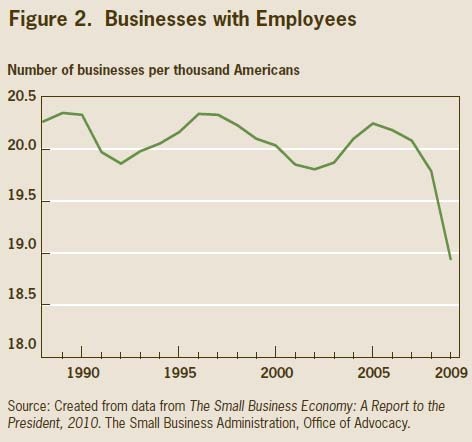 A growing share of the incorporated self-employed since the '00s are one-person S corporations (to take advantage of favorable tax treatment) or limited partnerships (LPs) and limited liability corporations (LLCs) in real estate for pass-through purposes that hire few, if any, employees.Consider that the US employment base is disproportionately dependent upon the viability of as few as 4% of the labor force and fewer than 2% of the population as the primary "job creators", i.e., incorporated self-employed. Spend some time walking through Silicon Valley or New York City, and you’ll likely leave under the impression that entre­pre­neur­ship is alive and well in the United States. But spend some time wading through some of the latest census data, and you may come away with a very different impression. Although many analysts claim most employment growth now comes from corporations, once again we have to look beneath the surface and ask what kind of jobs are corporations creating? More part-time fast-food positions? Two, small business tends to train workers who are then able to move up the job ladder to better paying corporate jobs, having learned the ropes at a small business. If you talk to corporate insiders, they will admit (in private) that their own job training efforts are limited: it's faster and more productive to poach your new hires from a competitor than invest years bringing up new talent. Corporations may point to their intern program as "job training," but this is all too often a PR facade for unpaid slave labor. How many interns learned anything remotely useful? How many end up with full-time jobs at the company? The typical answer is: very few. Thank you, William K. ($50), for yet another wondrously generous contribution to this site -- I am greatly honored by your steadfast support and readership. Thank you, Wayne H. ($50), for your splendidly generous contribution to this site -- I am greatly honored by your support and readership (and I dig your guitar playing, too).